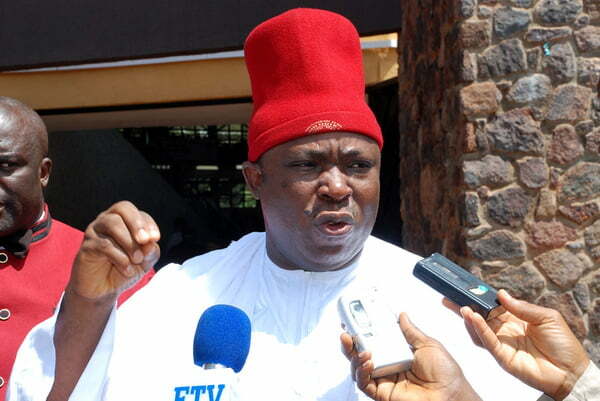 The newly sworn-in lawmaker representing Anambra Central Senatorial district, Victor Umeh has said that he was committed to those things that would unite the nation. Speaking with Senate Press Corps after being sworn in on Thursday, he berated those who reneged on their committment after oath of office, saying it was a risk to do that. Lamenting on how he was rigged out in 2015 general election by the Peoples Democratic Party (PDP) in Anambra, he counselled that politicians should be ready to observe rules and regulations to avoid confusion. “The only way democracy can survive is to follow rules and regulations. That of Anambra has been the longest and tortious because, some people are not ready to follow rules and regulations”, he pointed. He further revealed that Anambra PDP would always feature about five candidates at each senarorial elections until the party was challenged to a standstill in courts. He maintained that those circumventing rules and abuse oath of office would always bring problems to the country. The former APGA chairman recalled that he championed tenure interpretation for governors in 2006. “I was the first person that championed tenure interpretation in Nigeria. In 2006, when I went to court, I lost at the High Court, I also lost at the Court Appeal, but Supreme Court later gave me judgement which former governor of Anambra State, Mr. Peter Obi benefitted”, he maintained.